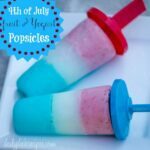 A fun festive popsicle for the fourth of july. Change up the fruit and you can have them anytime! 1 individual container of Chobani Greek Yogurt Flip - Almond Coco Loco (5.3) oz. In a blender, mix together the vanilla yogurt, the banana, and 1/3 cup of coconut milk. Blend until smooth. Add 1 drop of blue food coloring if you want to make them with a blue layer. (I only needed one drop with the icing color I used but if you use regular food coloring, you might need a couple of drops to get the desired shade) Blend until complete combined. Pour the blue layer into the popsicle molds filling 1/3 full. Put in the freezer for 30 minutes. While they are in there freezing, you can begin to make the next layer. Clean out the blender, now add the coconut yogurt from the Chobani Flip pack. We ate the almonds and chocolate mix ins separately. Don't put them in the yogurt. Mix the coconut yogurt with 1/3 cup of coconut milk. The coconut yogurt already has coconut in it, but if you want more, you'll need to add some coconut flakes... we usually just use it as is. Blend the yogurt and milk together and after 30 minutes of freezing the blue layer, pour the white layer on top. Now put back into the freezer, this time for only about 20 minutes or so. In a clean blender, mix the strawberry yogurt with the strawberries and 1/3 cup of coconut milk. Pour the red layer on top of the white layer. Insert the popicle stick at this point. The white layer shouldn't be frozen solid after only 20 minutes so getting the popsicle stick into that layer only takes gentle pushing. Put them back in the freezer for at least another 2-3 hours or so. We make them in the morning and they are ready after lunch. To release the popsicles from the molds, run warm water over the bottom of the molds. Very gently twist and turn until they come out. Enjoy!